The Empyrean Imperial Family is known to posssess a very secretive security group called "The Company." Wandering about the Lawless District, The Company joined Enzo Sipo, the leader of the Gunmen, who seemed to share a common goal. However, as time passed Enzo Sipo started showing his true colors. Enzo Sipo started to recruit cruel, violent outlaws and even called in Rangelus, whom even the Wespeace Military had given up on. The leader of ‘The Company’ O’Connell strived to persuade Enzo Sipo even after Varracht of the Sandstorm left, but betrayal was all he received in return. O’Connell no longer saw hope in the Empyrean, and decided to carry out an escape plan. As O’Connell held strong confidence in the legend of the Underworld, he decided to take The Company to the Underworld with a submersible hover craft from Dr. Giselle. Aboard the hover craft, O’Connell and ‘The Company’ traveled under the deep sea, arriving in Arad, a place only known as legend among the Empyrean. ‘The Company’ settled in Arad as mercenaries. Then one day, The Company seizes an opportunity to suppress a large insurgency during the change of the principality. The Agent stems from The Company, a once disgraced royal organization now reduced to a mercenary corp. As the news of their original leader, O'Connell, reached the ears of the Company, they sent several of their best agents to investigate. The Agent is unique in that his armament of choice primarily consists of both swords and firearms, blending a mixture of ranged and melee combat to a deadly degree. In addition to his diverse armaments he carries himself a sufficient level of agility and cunning, applying his mastery of espionage to his combat ability to become a very formidable opponent. Having both ranged and melee attacks, the Agent can weave in and out of the fray multiple times a fight. With the exception of the Hitman, all of his classes use their firearms at the end of their basic attacks. Secret Agents and Specialists can direct the angle of the shot by holding , , or as it fires. Possesses above average mobility thanks to all of his classes having some sort of dash skill. A fast hitter armed with only a Kodachi and Pistol. The Secret Agent provides a balanced mixture of sword and gun combat with the addition of movement. 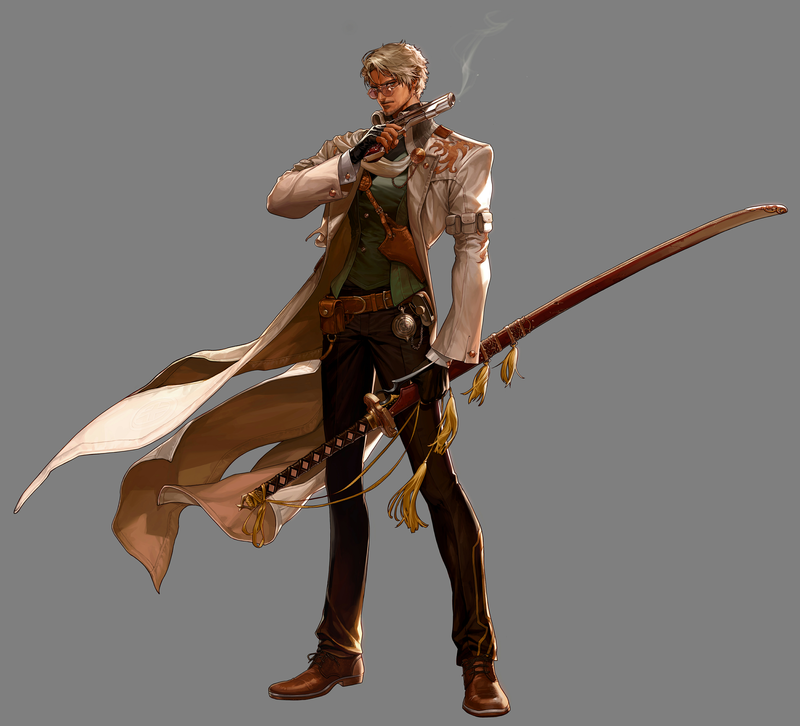 He is more proficient in sustained damage than his other subclasses in due part of skills that allow him to continuously barrage his opponent in gunfire and sword swings while seaming in stronger attacks. The Secret Agent deals Physical Percentage Damage and specializes in Leather Armor. A bruiser wielding not only a hardy Shotgun and a Square Sword but plenty of devastating explosives. While this class uses little of his melee weapon, it offsets by carrying copious amounts of bombs. Though he is slower than his other subclasses in terms of combat, he excels in raw damage and superior AoE with his Shotgun and bombs. The Troubleshooter deals Physical Percentage Damage and specializes in Heavy Armor. An acrobatic sharpshooter and swordsman specialized in fast-paced combat and armed with an SMG and a Odachi. Much like the Secret Agent, he provides a balance between melee and ranged combat but his ability to fire multiple bullets and sword swings in quick succession along with his oustanding mobility makes him well adept to striking in short bursts. The Hitman deals Physical Percentage Damage and specializes in Light Armor. A high tech genius armed with a Core Blade and Energy Gun built with Empyrean technology. While the Specialist may be lacking in damage output, he compensates with additional utility in that he is able to defend his allies or immobilize his threats. The Specialist deals Magical Percentage Damage and specializes in Cloth Armor. The Agent is the first class to be released alongside his own second awakenings.